“I love receiving massage. I know how deeply relaxing it can make someone else feel.” That’s part of the reason Moon Dickson feels passionate about providing a total nurturing and replenishing massage for each of her clients. Moon Dickson moved full time to Whidbey after having a private therapy practice in Edmonds for 20 years. She has been living in Freeland for four years, though she has shared an acreage parcel with her sister for 20 years. The move to Whidbey fulfilled a second passion for Moon: having a beautiful garden that provides her with a great deal of the energy she passes on to those who receive her massage services. Her educational background includes a B.A. in Recreational Therapy from Eastern Washington University (1988), massage certification from Brian Utting Massage (1991), and completion of the Horticulture Program with Edmonds Community College (2002). 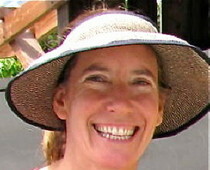 In addition to her massage work, she also designed and maintained numerous gardens and continues to mentor gardeners. Her massage practice incorporates several modalities depending upon the needs of the client. Her extensive professional training includes Swedish massage, deep tissue, Hawaiian bodywork (Lomi Lomi), sports massage, hot stone massage, Qigong and yoga. Sessions can be specific to healing injuries or holistic for balance, relaxation and health. Moon is also actively involved in the Whidbey community. She is a member of the Whidbey Island Massage Guild, Whidbey Island Holistic Healthcare Associates, Freeland Chamber of Commerce, WhidBees, Audubon, and the Giving Circle. Moon Dickson believes massage is as important as exercising and eating well…..an effective way to take care of yourself and stay healthy. To learn more and to make an appointment, email moon.dickson@gmail.com or give her a call at 206-550-4945.